Last night I was slumming over at MotionRC&#8217;s sales forum "Hobby Squawk&#8221; and ran across some discussions on upping the power in the Freewing Me 262. I have to admit I was amused that it has taken this long for Freewing to update this fine model. And puzzled that they chose to "upgrade" by down grading the power system! I&#8217;ve been flying an upgraded Me 262 for close to two years now. I need to be clear that the Freewing Me 262 does NOT need any power upgrades! But as I am flying mine at an altitude of 6K feet plus. I felt I might want to regain some of the power I was loosing to the rarified air. With the stock 3 year old 6 bladed power system I was pulling 92 to 94 amps after a 10 second motor run. Again I have to admit the flight performance from the stock powered Me 262 at 6k feet was more than adequate. My upgraded power package is a pair of HET 2W-27 2500KV inrunners driving 9 bladed WeMoTec 70mm Evo rotors. I had calculated that the stock 60 amp Hobby Wing ESC would still be suitable for the job, so they are the same as the original set up. 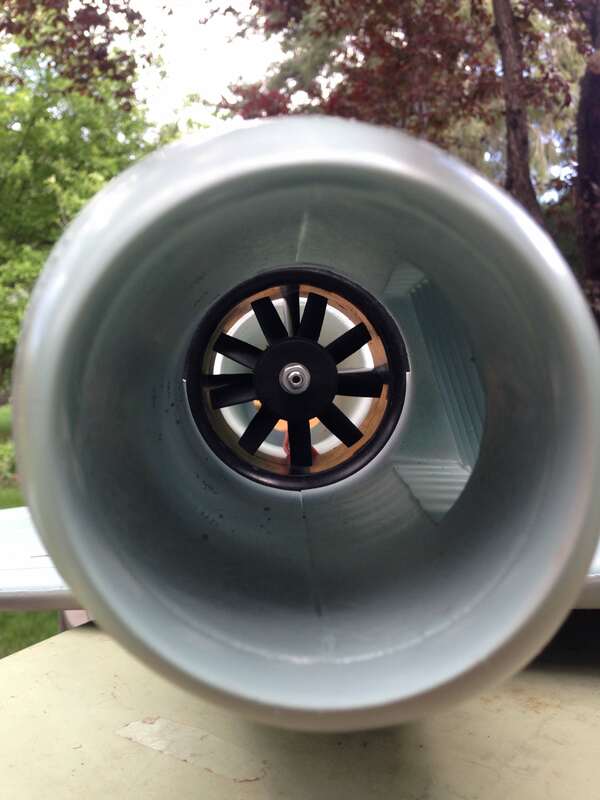 Now I am using the stock 70mm Freewing plastic housing that came with the 3 year old Me 262. This unfortunately result in less than ideal rotor tip clearances. But as I didn&#8217;t want to fit a set of WeMoTec housing into the nacelles I choose to take this aerodynamic efficiency hit from the large tip gap. Also as these and the WeMoTec housing are plastic I added finned heat sinks to the motors. I took this opportunity to use the heat sinks to stabilize the rear of the motors. With the same batteries (old 4.2v cells) the HET/WeMoTec set up is drawing 118 to 120 amps. This results in a huge power increase of over 25% at the battery. Now as a quirk of efficiency (this has to do with where the airframe drag and power curves cross) my actual flight times rose by approximately 80%. I actually fly at just over 1/4 throttle stick and still have more than enough speed and power for most aerobatic maneuvers. I only need to go to full power for those long verticals. With the 6000mAh battery I almost have a 1:1 power to weight ratio. So she get rather small in the up lines if I want. I now get flight times of 5 minutes with turn and burn flying and still have aprox. 20% left in the batteries. Yes, I was able to fly close to five minutes with the old fans but these would have been rather boring low energy flights. Now there is a real danger, it was also present with the the stock set up. Since the thrust comes from under slung pods and there is so much available it is very easy (in fact likely) that as power is added at slow speed that it will push the nose up into a deep stall. Do NOT add full power at the beginning of the take off roll or after a stall maneuver. Wait until the model is at flying speed before adding full power, or any power above 1/2 throttle. Many Freewing Me 262s are lost as the pilot adds full power trying to get out of a stall. 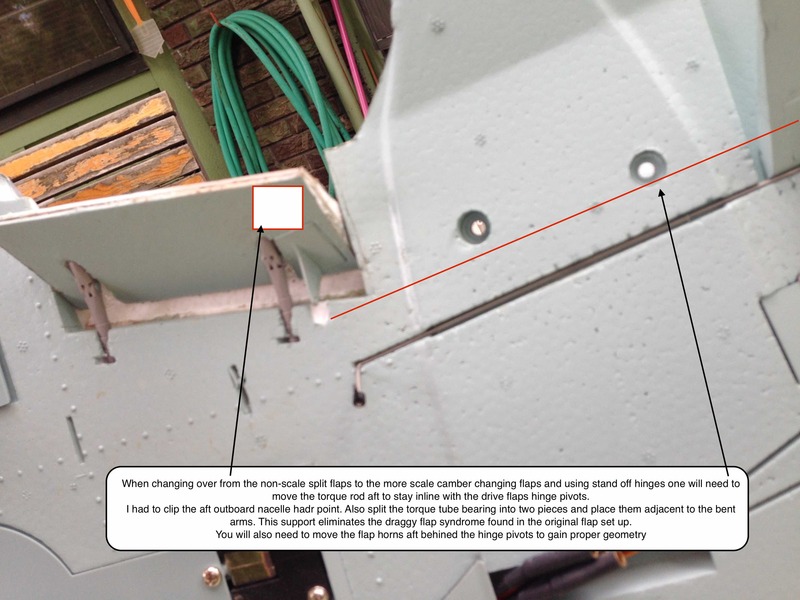 The stock Freewing Me 262 has a construction flaw in that the flap's torque rod is inadequately supported which allows it to bow when load is placed on the flaps. While correcting this flaw (adding bearing support at the very ends of the torque rod) I decided to correct an other glaring flaw. The real full size Me-262 does NOT have split flaps. Watching the real Me 262s flying in and out of Everett made this unacceptable for my scalish model. So I took the opportunity to correct this gross oversight. Also those small ailerons out at the tip are prone to adding a lot of adverse yaw. 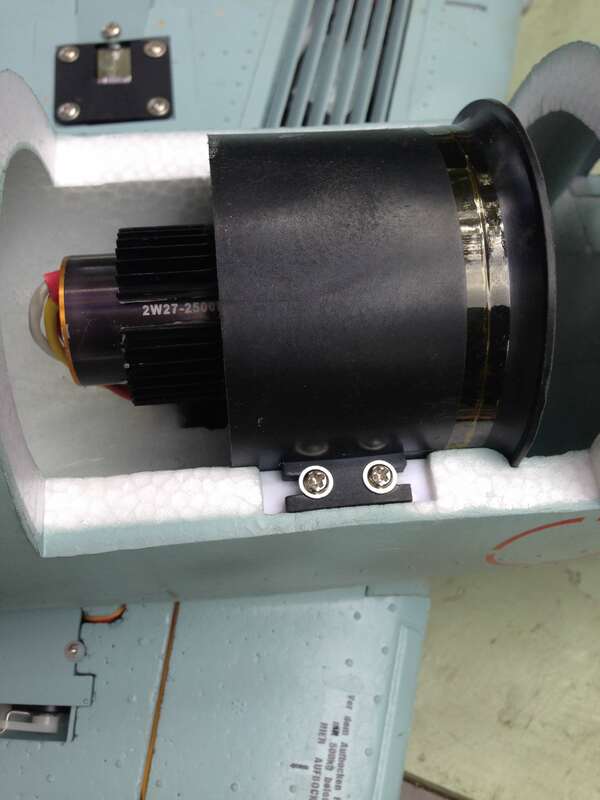 Freewing should show in the manual to place the servo horns slanted forward by one (or more) spline of the servo output shaft. As Freewing often cheaps out on the length of the push rods, I had to use a set of Park Zone push rod for the aileron push rods in order to reposition the servo arms. Actually it is a good idea to upgrade all the push rods on the wing with these as they have a much finer thread pitch for much finer trim adjusts. I&#8217;ve also added a rudder mix with about 12%, the rudder is small. This set up allows for real axil rolls even with the under slung power pods. I don't know what Freewing was thinking, the power system wasn't the issue. Most pilots have been complaining about the flaps, so in Freewing's wisdom they added the battery sucking 12 bladed fans! I saw a Freewing Me-262 here at sea level were I thought the pilot had mis-engineered the power system converting over to the 12 bladed rotor when he only had 90 seconds of run time (the Freewing 12 bladed fan has very poor performance compared with the WeMoTec Evo rotor). I'm shocked to learn that the 12 bladed fan is now stock! Somebody at Freewing must have stock in a lipo battery company! Wow, Hobby Squawk is practicing alternative facts. Really nothing new for MotionRC, as of late. MotionRC had a discussion Forum long before the current incarnation of Hobby Squawk. It actually wasn&#8217;t that bad as one could actually get technically valid input from guys like Alpha. Unfortunately Alpha made a gross managerial mistake in placing Eros in charge. And changing the focus of the forum to one where sales was paramount not the enjoyment of the membership through technical achievement and satisfaction with the products that MotionRC sold. It is from the lack of an honest discourse that we get &#8220;improvement" like this, where in the end all we get shortened flight times with the 12 bladed fan. If MotionRC and Freewing had been attuned to their customer base they would realize that yes, this Me 262 needs and upgrade. But the changes would be to the airframe, a smaller canopy and proper flaps along with a few quality improvements. And if anybody cares (themudduck) there has been no deletion of content in that Me 262 thread. The two year dead zone in content can be traced to this management change where the forum stagnated. https://www.hobbysquawk.com/forum/r...eous-rc-airplane-chat/1956-hobby-squawk-dying And yes the comment made by me way back then are still valid today. We could benefit from larger capacity cells. I have to say I&#8217;m perplexed at why so many are enamored with the 12 bladed crap. Don't folks realize that the early fighter turbojets sounded nothing like modern high bypass ratio turbofan found on modern transport? The screech of the 5 bladed fan sounds much closer than that swoosh of the high blade count when it come to mimicking the early turbojet. When I was flying this weekend I heard a lot of, wow those are neat Fowler flaps! While I understand what they meant I want to make sure those that attempt this modification (correction to the Freewing split flaps) understand these are not Fowler flaps even though they are bottom hinged. A Fowler flap has two main components to its function. First is that it moves aft in such a way as to increase the wing area. The second and more important component is that it is a slotted design. That is that air is brought from the bottom of the wing to energize the airflow over the flap segment. My design of the flaps on the Freewing Me-262 have nether feature. First is because I don&#8217;t think the original had Fowler flap. (Also didn&#8217;t want to make the rails to effect a Fowler flap action.) And second at these speeds and at this size I wasn't sure that the boundary layer and reynolds numbers would allow for proper and consistent re-energization of the air flow over the flap segment. Compound this with the fact that these are not made very accurately and I feared that I might have a great problem with asymmetrical lift (ROLL) with the flaps deployed. With the way I cut the Leading Edge (LE) of the flap and hinged them the LE of the flap stays in close proximity to the flap pocket radius. 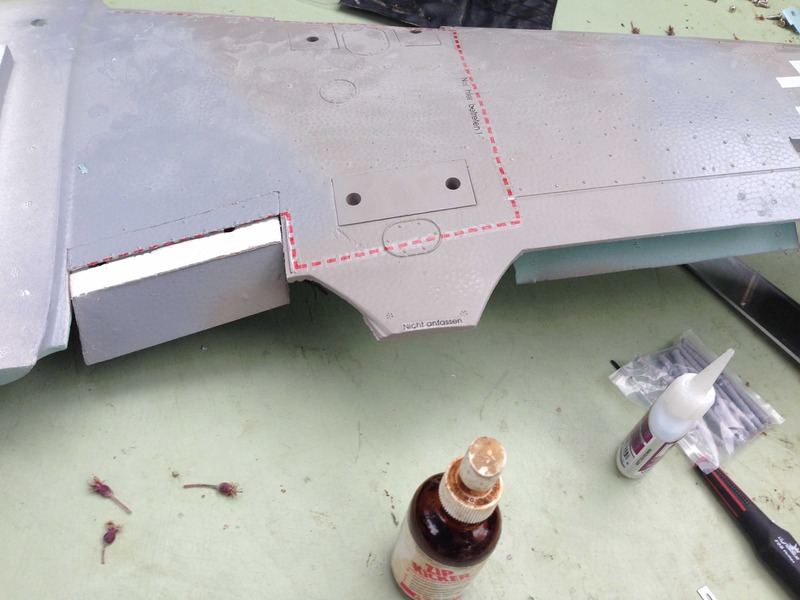 This is to try to effect a seal to NOT allow much air to bleed up from the bottom of the wing over the flap segments. These flaps are designed as plain, bottom hinged, camber changing flaps.